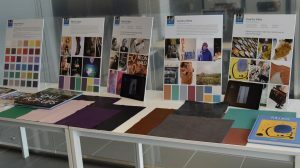 Stahl develops a variety of brand new fashion and technology collections each year. The Spring/Summer and Fall/Winter collections inspire to integrate the latest fashion, color and technology trends. Next to a fashionable look and feel, Stahl assures that the collections meet the client’s technical requirements, such as excellent quality, durability and specific performance characteristics. Total Shoe Concept spoke to Émilie Musso, The Fashion coordinator & designer at Stahl Design Studio®. She talks us through the FW18/19 collection and how the forecasts and collections all come together. Émilie grew up in France, lived in Spain, Barcelona for 3 years and then moved to Italy 1.5 years ago because Stahl opened a new lab there ‘and Florence is a lot more interesting for fashion’. Émilie speaks several languages fluently, such as French, Spanish, Italian and English and is just an all round lovely character. She travels the world meeting with clients and colleagues to present the latest trend forecasts that she makes for Stahl. The FW18/19 collection was released last May. Émilie started working on this collection in December of last year (2016). She’s now (June 2017) already working on SS19. It takes around 6 months from the start of the colors until presenting to the customers. 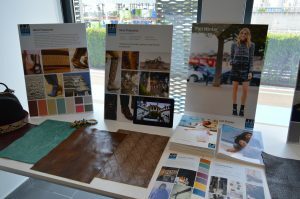 Stahl cooperate with color, fashion and trend forecasters and Émilie puts it all together into trends and stories. She gets creatively inspired by travelling the world, looking at different cultures, the streets, museums, arts, movies, shops, fashion, architecture, textiles and of course the internet. In the first month Émilie prepares, the colors and makes large-scale mood boards to inspire the technicians with what she has in mind. 12 Stahl Technicians from all over the world come together in Italy to meet with Émilie. They discuss touch, technical properties, and effects. Then the magic really starts and they start developing. It’s a very close working relationship Émilie explains ‘I cannot make leather; a good designer is nothing without a good technician. Our technicians are very good and it’s thanks to them that we can develop this amazing trend forecast. In the two weeks of development I talk to the technicians every hour, discuss what they’ve made, if I like it, or not and why’. After 2 weeks of dedicated development and production the trend forecast comes together and is produced into the books you can get as a customer from Stahl. Producing the books, images and leather pieces is what takes up most of the time. The books are great because they contain real swatches of leather, suede’s, prints, embosses etc. Stahl works together with some embossing suppliers in Santa Croce to create the trend forecasts with the right embossing’s. It’s all about a classic, timeless tradition in this trend. This trend is about tenderness and slow emotion. Contrasting combinations; for example a very classic Nubuck mixed with a crocodile emboss or a very natural and veg leather, mixed with something much more shiny. Grey’s and blacks from the street enriched with pinks and blues for a graphic touch of fantasy. 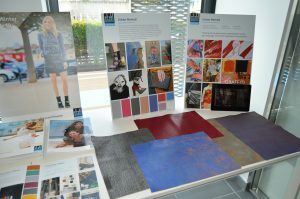 Next to the colour/leather forecast Stahl also created a Fashion Trend Report, which is very inspiring. Find out more about it here. It’s great to see the dedication within Stahl to create the right products for their customers. They truly see the importance to stay innovative and serve their clients. ‘If our clients are working well, we are working well. We want our clients to succeed, if they sell, we sell. We are talking about a partnership. Alone you are nothing.’ ’Émilie concludes our interview.